How to use this book; Writing your weld procedure; Identification of material; Choosing your filler wire; Heat control; Weld techniques; Equipment; Basic TIG welding for beginners; Appendices: Other steels and tool steels; Elements and their symbols; Millimetres to inches conversion table; Temperature conversion table weld procedure sheet. 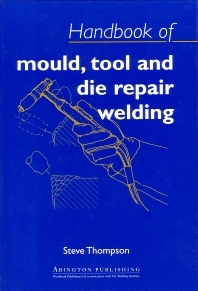 This book covers an important and frequently overlooked area of welding - the repair of moulds, tools and dies. Because two rather different trades overlap in this process - welding and toolmaking, the materials and techniques involved have tended to be obscured. For many years, toolmakers and tool users have had to rely on the small number of specialist welders who do understand exactly what welding repair involves and have the skills to carry it out. Understanding the technical side of tool steels is frequently a problem for welders and understanding the practical side of welding can be a problem for machinists. This book has been written so that specialists from both sides can get to grips with the techniques and procedures involved. It is an essential resource for Tool Room Managers and Foremen as well as maintenance and repair welding specialists. Steve Thompson is a fully time-served welder with 25 years experience in all aspects of welding and a particular expertise working with exotic pipework such as stainless steels and copper alloys. In 1989 he joined a newly-formed company intending to specialise in mould, tool and die welding repairs. He found there was little information on the subject, so he started to collect together notes, materials and diagrams on the techniques which made the job easier. The book has grown out of this process and its practical and accessible style is a direct result of Steve's first hand experience.